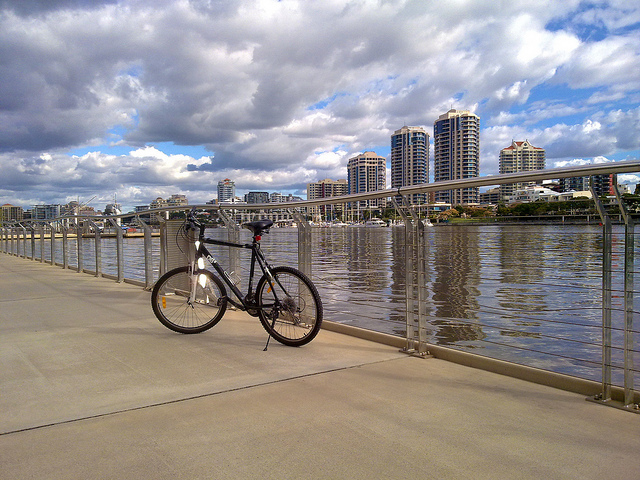 The 2011 Asia-Pacific Cycle Congress begins this Sunday in Brisbane, Australia. Photo by Urban Adventures. The four-day Asia-Pacific Cycle Congress begins this Sunday in Brisbane, Australia. The conference functions as a forum for elevating the profile of cycling in the Asia-Pacific Region. The United Nations is supporting sustainable transport in three East African capital cities through a $3 million project to improve walking, biking and public transport infrastructure in Nairobi, Addis Ababa and Kampala. The initiative centers on creating bus rapid transit (BRT) systems in each city. The League of American Bicyclists announced its listings of the 2011 Fall Bicycle Friendly Communities and the 2011 Fall Bicycle Friendly Businesses. The annual Thredbo Conference was held last week in Durban, South Africa. The event focused on xamining competition and ownership issues in land passenger transport. Norway’s Statoil oil company began featuring complimentary bicycling service facilities within its gas stations. New York City Metropolitan Transportation Authority (MTA) announced that this month it will begin work on finalizing the contract of the 7 line subway extension, which will connect to MTA’s new subway station set to open in December 2013. The European Chamber of Commerce in Vietnam organized the two-day GreenBiz Conference and Exhibition on European Green Business Solutions held in Ho Chi Minh City. Topics included climate change, sustainable cities and sustainable strategies for transport and manufacturing. Mmofra, a Ghana-based not-for-profit organization, is supporting child-centric urban development in Ghana’s capital city of Accra through its Playtime in Africa Initiative. The PICNIC Festival in Amsterdam, Netherlands finished up its three days of future urbanization-themed festivities today. Cities around the world are celebrating Park(ing) Day—a global one-day movement of converting parking spaces into livable public spaces. Philadelphia got in the spirit by installing the city’s first “bike corral” to house multiple parked bikes. AeroVironment finished the installation of electric vehicle charging stations at the Marriott Waikiki in Hawaii, marking the first commercial charging stations in the state. The European Parliament passed a resolution yesterday calling for actions to reduce non-CO2 climate changing emissions, which include black carbon soot, hydrofluorocarbons (HFCs), methane and ground-level ozone. Volkswagen unveiled six new vehicles in its New Small Family series at an auto-show in Frankfurt, Germany. Two are the natural gas-fueled “eco-up!” and the electric-powered “e-up!” Audi also introduced its electric 1 + 1 urban concept car technology. The U.S. Department of Energy announced 16 projects spread across 24 states and the District of Columbia to support activities accelerating electric vehicle adoption across the country. Newly released Department of Health statistics revealed that traffic fatalities are the number one injury-related killer of New York City children. Boston University held its fourth annual Bicycle and Pedestrian Safety Day yesterday. “The goal is to raise safety awareness and to promote respect between cyclists, pedestrians, and motorists,” said Webb Lancaster, a member of the University’s Bicycle Safety Committee. Bike/Walk Central Florida was awarded an additional $41,750 in support funding for its “Triple E Initiative” project targeting pedestrian safety improvements in Central Florida. For the past two years, Transportation for America research has identified Central Florida as the most dangerous area in the country for pedestrian safety. TheCityFix Brasil, the Portuguese-language sister blog of TheCityFix, recently entered the “Sustainability” category of the Top Blog 2011 competition, to be recognized as a leading voice of sustainable transportation. The Ohio-Kentucky-India Regional Council of Governments is seeking public input on a 2040 transportation plan for the region. The plan currently details 33 highway projects and six transit projects, including the Cincinnati Streetcar project, bus purchases, park and ride facilities and transit centers. Washington, D.C.-area metro announced plans to add 155 automated signs to bus stops by next year that indicate anticipated bus arrival times. The Vejdirektoratet – Danish Road Directorate in Denmark began its VejKryds.dk campaign to raise awareness of the dangers of right-hand turns. Pittsburgh, Penn. is hosting its Transportation Exploration event on Friday, September 23, celebrating the practice of sustainable transport in the city. Tags: Addia, Addis Ababa, Africa, Asia, Australia, biking, Boston, Brazil, Brisbane, bus rapid transit (BRT), buses, Cincinnati, climate change, Denmark, electric vehicles, emissions, Europe, gas, Ho Chi Minh City, Kampala, League of American Bicyclists, MTA, Nairobi, natural gas, Netherlands, New York City, North America, Norway, Philadelphia, Pittsburgh, public transport, road safety, streetcar, subway, TheCityFix Picks, United Nations, United States, Vietnam, walking, Washington, D.C.